One of the best ways to write persuasively is by repetition – saying an idea more than once. It’s a simple technique, but not simplistic. There are different ways to repeat an idea in order to persuade your reader and bring her over to your way of thinking. But you cannot write repetitively on auto pilot and expect to be persuasive. It’s not just theory. 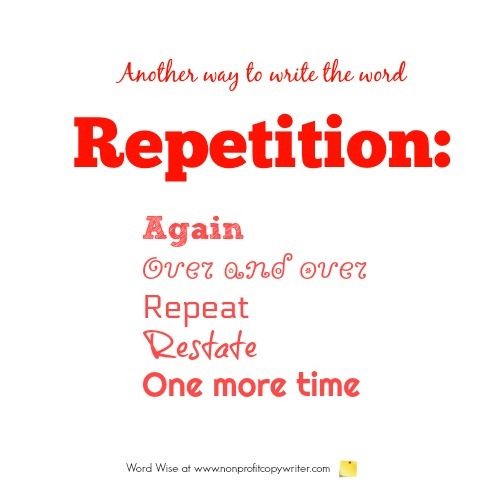 Studies reveal a psychological basis for the power of repetition. Think about what happens when you enter the grocery store. Perhaps you start your shopping in the dairy section, followed by the cereal, then the condiments aisle – every time – because you are familiar with the store layout and know where to find your favorite items. The phenomenon is called “The Familiarity Principle,” developed by research psychologist Robert Zajonc. The more you are exposed to an idea – the more it is repeated – the more familiar it becomes. We have a preference for people, tasks, and ideas merely because they are familiar. And get this: we fear what may be new or different. Enter in the value of repeating an idea. When you’re exposed to a concept more than once, your mind begins to think “this feels familiar” or “this must be true” because you’ve heard it before. Competing ideas take a back seat. As you hear the idea again and again, it becomes easier to understand and accept. Understanding is often taken as truth – and truth is persuasive. Let’s switch gears from the why (you’re convinced, right?) to the how. Find words or phrases that convey the same idea as your keyword. For instance, in place of my keyword, I use variations like repeat, over and over, again, more, and restate. Become best friends with your thesaurus. The fancy word is anaphora – that is, repeating a word or set words at the beginning of sections or clauses, like a refrain. A classic example is Dr. Martin Luther King, Jr.’s 1963 “I Have a Dream” speech, in which he restated the phrase “I have a dream” eight times. Make your point in several different ways with different devices: tell a story. Cite a statistic. Quote a celebrity. Provide a compare/contrast illustration. Use a metaphor. If you repeat a word or phrase too much, you run the risk of appearing amateurish. If you repeat an idea too much you can alienate your reader, say social psychologists John T. Cacioppo and Richard E. Petty. Their studies in the 1970s and 1980s found that repeating too much made readers disagree, perhaps as a defense. You can work around this by purposely offering an opposing view or pointing out obstacles, as I’m doing right now. By raising objections, you tell the whole truth. Which in the end, helps persuade your reader – the whole point of repeating yourself, anyway.